Dormitories are seeing a sharp drop in business as companies move their foreign workers out of big purpose-built dorms in favour of cheaper options on or near their work sites. Dorm bosses say that there are at least 5,000 empty beds, and business has been getting poorer. This is a sudden turn in the state of affairs from just a year ago, when dorm bosses had long waiting lists of employers wishing to house workers in big purpose- built dorms with facilities such as foodcourts and basketball courts. Now, dorm bosses are blaming firms for the empty beds, saying they are moving workers to construction sites and factory-converted dorms which are dirtier. Construction bosses, in turn, are blaming dorm operators for setting fees at too high a price. To date, there are about 40 dorms offering 200,000 beds for foreign workers. Another nine will be built in the next two years, adding 100,000 more beds. But even before those have been added, Dormitory Association of Singapore president Kelvin Teo said that business has already dropped sharply. "Business is definitely not as good before. There is some worry from operators about how their business will fare, now that many new dorms are coming up," said Mr Teo. Part of the reason for this exodus is that more construction firms have been given permission by the authorities to set up quarters on the sites of major building projects. These include sites for new Housing Board flats and MRT stations and lines. Tiong Seng Contractors director Derick Pay said firms like his are grateful that they are being allowed to house workers on site. It reduces traffic congestion around the area, seeing as workers do not need to be bused in. It also increases efficiency and cuts costs. "We can reduce two to three hours of travelling time since workers live and work at the construction site," Mr Pay said. Tiong Seng has about 100 workers living on a site for an upcoming HDB development in Woodlands, and more will be moving in soon. 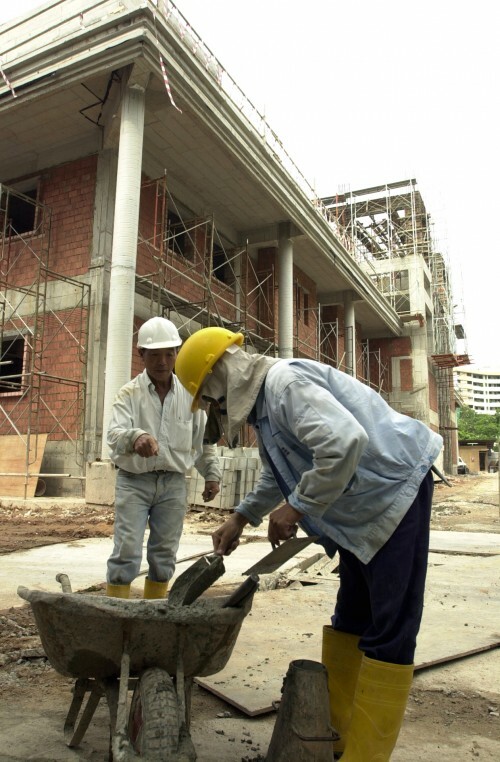 The Manpower Ministry and National Development Ministry said in a joint reply that "proximity to workplace, convenience and costs" are considered by employers when deciding on housing for workers. "Employers can house them in a variety of accommodation, such as purpose-built dorms, converted industrial premises and quarters on construction sites", they said in a statement, as long as these meet rules that "ensure the safety and well-being of the occupants". The Land Transport Authority said there is currently only one dorm located on an MRT project site - that of the upcoming Gul Circle station and viaducts for the Tuas West MRT extension. Another issue is cost, said Singapore Contractors Association president Ho Nyok Yong. "The prices for such big dorms keep going up. Some are even charging around $320 a month. That is too expensive," he said. But some dorm bosses shot back, saying that employers are not interested even when prices are slashed. Mr Ken Lim, chairman of Singapore's biggest dorm operator Vobis, said response was poor even when he reduced prices to $250 a month from $320 as part of a National Day promotion. In recent months, he has also been advertising in newspapers. The company has at least 3,000 empty beds, across the seven dorms it runs. "I am not sure what else I can do to attract employers," he said. Ms Debbie Fordyce, executive committee member of workers' rights group Transient Workers Count Too, said she is sceptical that the majority of bosses will choose to house their workers in pricier purpose-built dorms if they can opt for poorer but cheaper accommodation. "It's all about cutting cost for employers. Workers will not complain about living in poor housing too, as long as they are paid. The men just want to earn money and go home," she said.